The psychological effects of colour can boost the way you train and make your progress a lot more enjoyable - they can even help you decide what you choose to do at the Club and what you wear to do it. From the lively pool to a calming yoga class, a fiery fitness routine to a lifting Zumba lesson; colours set moods. But what if colours could identify specific classes and activities? These are the sports we think colours could represent and could help you choose what to try next by choosing a favorite colour. Take a look and let us know if you agree. 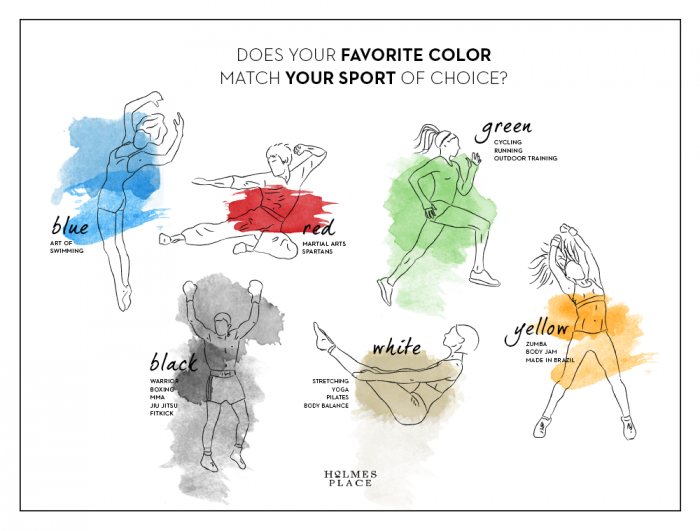 What if your sport of choice could show its ‘true colours’? From the sky to the sea, blue is the colour of calm and tranquility. Just thinking about blue can make you feel like taking a deep breath, soothing the mind. Blue can, of course, mean sadness; but it also represents stability, seriousness and truthfulness. It’s also related to trust, infinity and harmony. Activities related to this colour would be all water related, from Art of Swimming in the pool to the jacuzzi, sauna and Turkish bath. It is said that red represents a masculine energy. It is bravery and excitement. It’s a natural sign of warning, can boost appetite, represent anger, danger, and velocity - but also of desire and passion. Sports associated with this colour would be martial arts, boxing, Spartans and X-Celerate. Jungles, forests parks, tropical islands… nature comes in all shades of green. Harmony and growth relate to this colour. It also represents prestige and money in darker tones as well as jealousy, envy and greed in lighter shades. Fertility and renewal are associated with this vibrant tone and it can be associated with running, cycling and outdoor training. White is the mix of all colours: with its soothing and peaceful vibrations it’s said to have more shades available than any other colour. White is balance, purity and contentment, while also standing for introversion, emptiness and simplicity. Activities associated with this colour would be: stretching, yoga, pilates, Body Balance and meditation. Yellow is the perceived colour of the Sun and portrays happiness, energy, lightness and brightness. Optimism and confidence are emotions related to yellow; as is the ability to concentrate, with research showing that studying in yellow rooms increases focus. Brimming with feelings of summer and joy, yellow is a perfect representative of the creative dance moves of Zumba or the energy of Body Jam - not to mention the intensity of Made in Brasil. The world of fashion loves black; with all hip and happening trends considered to be ‘the new black’. Dense and mysterious, the full dark shades stand for power, strength and independence. Black can represent authority and sophistication but also sadness and grief. Warrior, boxing, MMA, Jiu Jitsu or Fitkick are classes that can easily be associated with the power, strength and intensity of the colour black.